Why are ETs keeping quiet? "There is a basic law of the Universe which grants each and every individual independence and freedom of choice, so that he may experience and learn from his experiences. No one has the right to interfere in the affairs of others....If we disregard this law, we must suffer the consequences, and a little thought will show that our present world state is directly attributable to violation of this principle." Let us consider this statement more closely in light of the fact that, on the basis of probability, ETs should already exist but for some reason we have not heard from them. Why? Well, Let us suppose ETs have learnt to live with themselves and their technology thereby increasing the probability of finding ETs throughout the universe to such an extent that we might as well throw out Drake's equation and say ETs exist in abundance. Could ETs, especially those capable of reaching our planet or have the technology to communicate with us, be playing the non-interference game with us as the reason why we have not heard from these ETs at the present time? It is a reasonable proposition to consider. 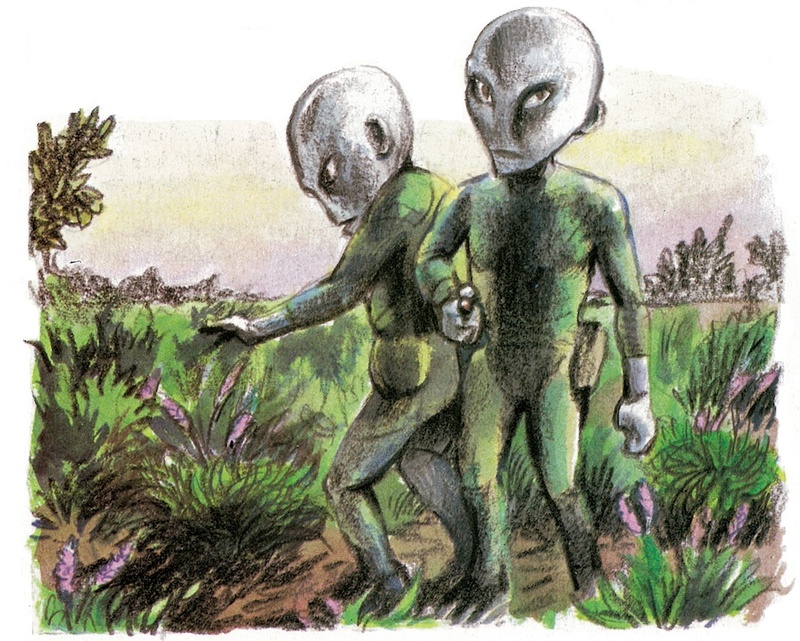 Artist impression of the aliens observed by lavender farmer Maurice Masse on 1 July 1965. The UFO case is a classic that has baffled scientific investigators to this day. Whether you believe in UFOs and aliens visiting the Earth or not, the picture you see here was published in The UFO Casebook from Orbis Publishing Limited (UK) (1). It represents the best artist impression picture of what the aliens looked like, including a couple of interesting behaviours worthy of discussion, and all fully supported by the original witness for this case. The witness was Maurice Masse, a lavender farmer who lived in south-eastern France. According to his statement, on 1 July 1965, Masse said the aliens arrived and later left in a large, metallic symmetrical flying object. Ignoring how these aliens could have travelled to the Earth in this type of object, we do notice something interesting. The first thing has to do with the way the aliens behaved towards the lavender plants: they were curious. Understandable considering this is a common human trait among our scientists. If a human scientist was to visit an alien planet and noticed something of interest, he would naturally behave in exactly the same way as we see in the aliens in this French UFO case. Nothing unusual. But that is not all. Look more closely. Have you noticed something else? As you can see, one of the aliens was behaving differently toward the farmer. More specifically, they were not exactly curious at the farmer (at least not at that precise moment during their study of the lavender plants). Rather their curiosity was directed almost exclusively at the plants being grown by the farmer. This isn't exactly a visit to say "hello" to humans as much as the SETI scientists would like to think. Assuming the observation is true (and so far no scientist has been able to fault the case to this day), why would these people, who we might describe as ETs, be avoiding us? What would be the advantage in doing so? And more interestingly, why are ETs, with their alleged and truly astounding technology in reaching us, not exploiting our planet in a sense that they can take over what we have and wipe us out knowing they can become the new dominant species on Earth if they so choose? What is preventing them from doing so? Do aliens want to preserve our culture? Once possible reason for avoiding us is because when isolated primitive tribal communities meet with more advanced societies face-to-face, more often than not the lesser-developed societies become decimated soon after the encounter. The reasons for the decimation can be understood when we see how the acquisition of new knowledge and/or new micro-organisms from an advanced society could disrupt the traditional, but stable structure of the primitive societies, and vice versa. Whatever the reason, the overriding sociological principle may be to preserve the culture and well-being of an otherwise isolated civilization. Today, scientists appreciate the principle of non-interference when it comes to studying other human cultures and animal species. The best way to gather the most useful information is simply to keep to a safe distance, or to be as inconspicuous as possible in society while watching what goes on among other creatures. Do aliens need to make contact with us? But what about a slightly more advanced civilization like our own? Wouldn't ETs miss out on the benefits from making contact with us? To take this question even further, we should ask ourselves: Why would they feel obliged to make direct contact with us (5), and thus interfere with our day-to-day activities, when they can study us undisturbed in our natural environment? As for access to resources they might need, wouldn't they have enough of what they need in space without having to come to Earth and interfere with us? If this isn't true, how is it possible for us to be here today? A conquering alien civilization looking for resources would have taken over the Earth a long time ago. Yet the astonishing thing is, we continue to exist to this day. IF ETs do exist (there is nothing in the scientific observations to suggest otherwise) and have found a way to reach us, they are not exactly looking like they are hell-bent at taking over our planet. Let's face it. The universe is a very big place. A lifeless planetary world would have more than enough materials to build just about anything. As for food, anyone with half a brain can learn how to freely recycle everything from plants (and animals, although likely genetic engineering will probably see plants provide all the nutrients) from their own native world. As for what ETs would like to have from other civilizations (apart from the genetic code to prove the existence of ETs from their own scientific perspective), there are enough materials in the universe and technical know how among the advanced alien civilisations to recreate virtually anything they want. The universe is big enough to support the needs and wants of all intelligent life in the universe without having to directly interfere with us or anyone else. So why would aliens need to take over our planet for our resources? "If the intelligence of these [alien] creatures were sufficiently superior to ours, they might choose to have little, if any, contact with us. Are aliens more worried about us? Or could it be closer to the truth to say that ETs are avoiding us because they are actually more concerned about us rather than us of them? Well, let's face it, how friendly are we to anything that might look different to us? And if we develop the technology to take us to the stars, what would we do when we are out there? Given our war-like tendencies and desires to acquire resources from new worlds in the name of profit and ultimately become famous or seen as important, ETs are probably more worried about our aggressive stance to acquire what we want. We have little understanding of using the right materials and ensuring everything is recycled. More of a reason for ETs to learn all they can about us in an indirect manner without ever needing to interfere in our Earthly affairs. Come to think of it, aliens may not even have to visit our planet to learn what we are doing and who we are. Any technically-advanced civilisation in our local neighbourhood of (sun-like) stars up to 100 light years away would be capable of picking up our receptions from Earth using a radio telescope as powerful as the one humans have at the Arecibo telescope. And you can be sure the aliens are watching and studying us in every detail, including our daily news, from television and radio broadcasts. Now just imagine the sorts of things ETs are learning about us right now. Not too flattering unfortunately. With our ever-expanding wave of radio, military radar and television emissions emanating from the Earth over the past 100 years, we can only wonder what the ETs must be thinking right now when they see horrific images of people starving in Africa, our world wars, and others fighting each other for power and greed on our daily news broadcasts and other information sources. Not exactly a riveting sign that we are approachable, let alone have the right attitude to preserving all forms of life in the universe. Come to think of it, much of the problems ETs are probably seeing from us is our general inability to live within our means (i.e., to recycle everything we produce); and not being able to tolerate differences in our appearances, beliefs and behaviour among our fellow human beings and other lifeforms (i.e., value creativity and new insights and understand there are different ways we can solve problems). Instead we feel as if it is our right to interfere and tread heavily on the environment and others for whatever we want or need. Our general behaviour to our fellow human beings and life in general is not exactly a beaming welcoming message to the ETs for them to come down and say "Hi!" In fact, quite the opposite. If anything, it would end up being potentially more suicidal for ETs to make direct communication with us assuming they have found a way to reach us. We only have to look at the Americans for an example. With the way law enforcement officers and members of the public are prepared to "shoot first and ask questions later", an ET coming down to meet an American citizen might end up being dead quicker than you can say, "Blimey, who the heck was that I saw?" Far too many humans are simply not ready to meet with ETs mainly because of a lack of good education in understanding why they are here as well as understanding the superficial differences we will observe in ETs and why that might be so based on their environments or personal choices should we encounter them in real life (7), the advantages of those differences (there would be a good reason), and knowing how we should behave when we see them. Still not convinced? We only need to explore our own backyard to see how true this is. Are we really that approachable and easy to communicate with as a global society? Seriously, if we still cannot solve our own world problems right now, how can we expect to treat aliens with any form of dignity, respect and friendliness when we get the chance to meet with them? We need to have understood something about the principle of love here on Earth before we can ever contemplate the idea of meeting with and communicating with what are essentially people from other worlds. "They are not interested in settling here [assuming they have solved the interstellar problem], they are just worried about what we will do when we get out there. They know it is only a matter of time - say about 100 years, nothing in galactic terms - before we send out starships and attempt to become part of the Galactic Federation. Before this happens they want to make sure they know everything about us. They see a primitive society which is mostly engaged in tribal warfare, so of course they want to know a lot more about us." So don't be surprised if aliens have everything they need to survive and probably living quite happily without us to make the Drake's equation look redundant. They are almost certainly out there. What is the real issue is how those civilisations that can travel to the stars are probably more concerned about our state of development at a time when potentially we could be fast approaching an understanding of the technological secret behind interstellar travel. Will we be a threat to the ETs if we should visit their homes? How will we react when we find another Earth-like planet? Are we going to plunder the resources of that planet for our own selfish wants? Will we start a war with ETs because we cannot tolerate differences in our views and appearances? Until then, and while we are still stuck on this planet and ignorant of the electromagnetic technology in the UFO reports, there would be no good reason for ETs to make any form of direct contact with us. What for? They can observe and learn everything they want by watching us and studying our radio and television broadcasts from the comfort of their exotic homes wherever they live (if not within close quarters by approaching our planet). In the meantime, ETs can choose to keep very quiet with us just to make us feel alone in this universe as part of the big lesson we have to learn about the principle of love before we can consider visiting other star systems. If ETs should ever make direct contact with us prior to our time to visit the rest of the universe, it would be with just one or a couple of humans at a time, usually in isolated country areas, and purely for scientific research by way of gathering biological samples such as blood from the human. And if the ETs are even kind to give messages to help humankind about what we should do to follow the right path into the future, it would be a bonus. Should we be worried by the aliens? Given how primitive human societies are at the present time (with our basic education levels), some humans will naturally ask, "Should we be worried by the aliens if they can reach us? Should we not be aggressive and defend ourselves?" An understandable view given our long history on this planet. We can only go by history and what we have learned is that many of us are still maintaining a sense of fear about other people and the rest of the animal kingdom. Why? It may be because we do not understand why there are differences (either physically, or the beliefs we carry with us), as well as the fact that we must all survive. Indeed, the simple act of observing physical differences is enough for some some people to think we need to destroy (or cut down and bring them to our level and force them to assimilate in our familiar and comfortable way of doing things, known as the tall poppy syndrome) the thing that is different because of a deep-seated fear that our survival is at risk if we don't do anything to stop the differences. We have done it to so many different predators in evolutionary history thanks to our realisation that our technology of spears and guns can control the animal kingdom, and now most humans, so why not maintain this view with the aliens too? Seriously, what other purpose could there be for the aliens on reaching our planet given the enormous distances they had to travel? it seems unlikely these aliens will want to go back to their planet willingly if they saw what's on Earth and the kind of life these aliens could have or benefit from. Is this concern justified? No. All our assumptions about ETs are based on the view that aliens are not intelligent enough to solve their own problems at home and hence be able to return knowing they have everything they need on their own planets. why do we underestimate the intelligence of aliens to the point where we think the aliens are looking for a new home and are ready to take over our planet? Even if something has happened to their own planet, should we continue to believe aliens will want to colonise our planet and destroy humankind? Of course not. Seriously, why would aliens want to be aggressive to us? And how would this go down among the more advanced alien civilisations out there who do have a planet to go home to. If they could see what could happen should another ET have thoughts of taking over our planet, would they let it go? Or would they feel threatened by such action? If it is the latter, what would stop a highly advanced alien civilisation in putting into place the aggressive ETs? Nothing. There has to be a certain sense of respect and love shown to all lifeforms that emerge natively on a planet. You simply cannot go about taking over another planet just because it looks nice, or it has the resources you need. Or else what would stop another civilisation from doing the same to you and your planet? Something is telling us it is unlikely the aliens would do anything to us in a negative manner. Aliens reaching our planet would want to be as friendly as possible, especially if there is likely to be contact with humans. If anything, the ones we should worry about the most are ourselves. And this might explain why our concern might be justified. Just think about it. If we had the technological means to reach an alien planet, what would our fellow human beings do if the opportunity presented itself to them? Would we simply walk away after seeing and studying the planet from a distance? Or would there be people on Earth who would want to plunder the resources of another planet? Or, heaven forbid, even colonise it? Now we can understand where our concern comes from. It has to do with our attitude to life as dictated by our own evolution and past experiences living with other humans and the rest of the animal kingdom. Our attitude has come about after living on Earth for a very long time and having to deal with other predators and find ways to survive. We have not realised we can survive comfortably and indefinitely without fear. We can live side-by-side with our fellow human beings and understand the situation for other animals on this planet. All that is lacking in life has been the love. And we all need love. And when we do love, there would be no need to interfere and cause harm to other life forms just to survive. We have the knowledge and technology to live in peace for all times if we so choose. Once we realise this fact, what will this mean for the aliens when we encounter them? Should we continue to maintain this concern with the aliens? Of course not. If you need further reassurance of this reality, then observe all around you. Any alien civilisation that can reach our planet would have wiped us out by now given how long we have been surviving on this planet. But look at us now, we are still here. How astonishing. The fact that we are still here must reign as one of the most significant scientific observations in human history. It is extraordinary that we continue to survive to this day and not be affected by other alien civilisations to the point where our survival is at risk. Clearly we are not at risk. No ET invasions as you might see on those poorly scripted sci-fi films, such as Independence Day. They are all crap. The reality is that we are still here. And the only way to explain it is because those aliens that are able to travel to the stars are following a universal law the forbids interference with other civilisations. Still don't buy the idea? Let us put it this way. It really does not take much for an advanced civilisation, even one just 50 years more advanced than another, to have the knowledge and technical know-how to manufacturer a deadly virus to specifically target a biological weakness of an aggressive alien civilisation. If such a virus was to be unleashed on the planetary home of an aggressive civilisation, it would be devastating. Before the people of that civilisation would ever know what has happened (let alone who created the virus), it may well be too late. In terms of the civilisation that introduced the virus, the advantage would be significant. No direct confrontation leading to a so-called Stars Wars scenario. It just won't happen. But if an aggressor does not change its ways very quickly, true guerilla warfare-style to the extreme can be applied by another alien civilisation. So the lesson in all of this is stop interfering in the affairs of others. If it does not help the other civilisation, then let it go. Move on. Solve problems differently and with love. Fail in any way to do this and the consequences would be too hard to contemplate. The result could be entire civilisations disappearing virtually overnight through the actions of another civilisation to control the aggression. This fear alone and knowing more advanced civilisations exist in the universe would probably be enough to see many of the lesser advanced civilisations to learn the principle of love very quickly and o behave themselves when visiting other life-bearing worlds. However, even if in the slightest possibility this is not true, why take over other life-bearing planets? There are plenty of other worlds with no life on them to benefit from their resources. And if not, surely an advanced civilisation would already know the value of recycling all wastes to ensure a life-bearing planet will be sustained for as long as their own parent star and the universe allows it. A truly intelligent and advanced civilisation would already know the benefits of recycling for its own long term survival. Do aliens need more time? But even if we were to be friendly and able to solve world problems. What then? Will ETs come down to communicate with us? Not necessarily so. With only reports of close range UFOs and their occupants to rely on in this discussion, we do find examples of where ETs have shown some language difficulties when communicating with humans (e.g., the Antonio Villas Boas UFO case). On the same token, we can also find other cases where the occupants are able to speak perfectly good English to the English-speaking witnesses (sounds like they are learning plenty from our radio and television broadcasts). So technically, there are other civilisations out there who could communicate with us if they so choose. Perhaps this is more a problem of dealing with our Earthly bacteria and viruses? Until ETs can adapt to our environment, more time may be needed. However, on closer inspection of the UFO reports, we can see some aliens are able to survive on Earth for a certain period of time  enough to take small samples of plant material (e.g., the Maurice Masse UFO case), some Earthly blood from humans and perhaps some sperms (e.g., the Antonio Villas Boas UFO case) and a human egg (there are other UFO cases supporting this), and that is about it. If there were to be more direct physical contact with humans, it is not surprising to find some cases where UFO occupants will use a clear, thick liquid (the type that evaporates quickly like the bottle of Dettol clear liquid disinfectant hand wash you might take with you in your bag) to wash the skin of a human witness. Sounds reasonable if the aim is to control the levels of Earthly bacteria on human skin and stop them from making contact with ETs (in case their immune systems are not yet adapted to these microorganisms). Yet even with such precautions, it does not stop ETs from coming down to Earth and choosing to communicate briefly with us. Or maybe ETs want an extended visit in case something happens to their own planets due to exploding suns or a big enough asteroid? More of a reason to help some ETs to find a place to stay for long enough time until they can find a means of surviving in space or on another planetary world devoid of any native life. But to do so would probably require further study of our planet and further evolutionary changes to better adapt to our planet before considering making a request to our leaders for help. But then again, if ETs are really smart, they would have understood the importance of recycling everything to ensure their planet can sustain life for as long as their parent star remains shining and at a constant level. And if something should happen to destroy their world, they would have been thoroughly prepared to adapt to other planets where no native life exists, or build a big enough spacecraft to carry all the essential things ETs will need to survive. Potentially there would be no need to live on another planet containing advanced lifeforms. In which case, why would ETs need to live on our planet? It seems the only reason ETs would choose to visit our planet is to learn about our plants and to gather small samples of blood from certain animals and that is about it. However, they prefer to do it indirectly as they go about their own activities and not tell us upfront to the world what they are doing. All this sounds more like the ETs don't really care that much about humans. Maybe some ETs may have concerns about what we are doing. But on the whole, the general attitude of most aliens seems to be one of, "Who cares about humans? We have got better things to be doing than say 'Hello!' to an entire human race." In the meantime, aliens would be perfectly happy watching us do stupid things. If anything, it could be a benefit to the aliens in the sense that they can teach their own alien kids about our planet and how stupid we were in not learning to do the right thing. Better to have the smarter and more intelligent creatures surviving in the universe and let the less intelligent ones get snuffed out by their own stupidity. Who knows? Darwin's theory of evolution and natural selection could be alive and kicking in the universe to a far greater extent than we ever realise! It is starting to look like ETs should be here by now and, if the UFO reports are anything to go by, have already reached our planet. Even if we don't believe this is possible as yet (until a prototype of the electromagnetic vehicle is built, which won't be long now), the feasibility of building a nuclear-powered spaceship on paper using present-day man-made technology (according to Project Daedalus), and in the accepted mathematics of galactic colonization, suggest that they should be here. Contact with ETs to say, "Hello!" should have been made long ago. The fact that it hasn't (well, at least not on a global scale, but only limited to a few humans in the past and even this is not really designed to say, "Hello") and that we are still here suggests that this is more a question of ETs choosing not to make direct contact with us. We can discount things like aliens needing extra time to take over our planet. They have had the last several hundred millions of years to make the decision (there are many more older stars and galaxies out there), and incredibly they haven't. The only sensible explanation for this is that the aliens are keeping quiet with a primitive civilisation such as our own. Why? No surprises, it must be because of our world state of affairs and how this could be stopping advanced ETs from having any direct and meaningful discussion with us. Furthermore, ETs may be choosing to avoid us for other good reasons, such as to study us and other lifeforms on Earth for their own scientific work. Whatever they are up to, it is most likely ETs don't need anything from us to survive. They will have practically everything they need elsewhere in the universe. We should, therefore, not expect to see ETs preparing for "invasions" of our planet or any such silly ideas. Such ideas of "invasions", "colonizing our planet", "wars between humans and ETs" and so on are purely a man-made construct (based on our long-held evolutionary fears) having no bearing on the real universe. The more realistic view of what's happening out there, especially for those able to travel to the stars, is that ETs are following a universal law of non-interference with other civilizations, especially our own. It is part of the principle of love we all should follow. And if we are close to the point of venturing out to the stars, one can imagine these civilizations would have every right to quietly gather information about us. They have to when dealing with us at some point in the future. We remain a highly primitive civilization with some technical abilities, but we have not yet fully mastered the principle of love in solving all world problems (let alone the electromagnetic technology observed in the UFO reports). We might be relatively clever, but our heart is not yet in the right place for the protection of life in the universe given the way we treat life on our own planet in general. Consequently it would be far better for the aliens to simply hide from us rather than to make direct contact with us, and later deal with our stupidity should we reach their planets and do things we shouldn't. Then we will pay the consequences for our feeble-minded actions once the aliens know our weaknesses. Learning everything about us would have to be the wisest approach, for then the options to deal with us will become evident and most probably many and varied. And if we have to have our asses kicked by ETs, it won't take much for ETs to devastate the human race. Thus more of a need for humans to get its backyard in order and start applying the principle of love before we start travelling out there. Yes you can assume aliens travelling to the stars will be peaceful. They will have no choice. No one wants to have their alien "asses" kicked by a more advanced alien civilisation. This is one area where we can put our human views on ETs aside. No matter how advanced ETs might be, they will always have the same choices as we do and can behave in two general and opposite ways. Should they have found a way to reach us in any form of technology, they will have to choose because they have the power to affect other lifeforms. It means they can choose to behave in a peaceful or non-peaceful manner. However, if ETs should ever choose the non-peaceful route resulting in many life forms getting harmed, then the consequences for any civilization choosing the non-peaceful path will be dire. No civilisation can survive the onslaught of a slightly more advanced alien civilisation putting the aggressive and less-advanced civilisation in its place. For all it takes is a more advanced civilization to see what is happening, to feel threatened by the aggressive civilization not doing the right thing, and for the more advanced civilization to put an end to it with incredible ease by sending a biological virus targeting the aggressor in a specific and devastating way. Then there would be no time for the aggressors to stop themselves becoming extinct. Therefore, the decision ETs (and, by implications, for humankind) must make has to be the peaceful one. There is a choice, but really there is no choice. It is a kind of paradox. Everyone will have a choice, but in reality, once you start to apply your actions to the universe, you have to choose the right path. You have to choose the path with a heart and the one that leads to peace if you wish to survive for a long time in this universe. "A horse can always be led to a water-hole but cannot be made to drink from it." Similarly a knowledgeable alien may also lead itself, or be led, to the so-called "water-hole" band, but scientists cannot sit around patiently and expect the alien to make its presence felt there. Nor will sending vast numbers of signals from our planet in the "water-hole" band guarantee aliens will communicate with us. There clearly has to be another way to find the evidence. All this is telling us is that at some point we must expand the search for ETs into other more promising and fruitful areas if we are to get a quicker result. Whether it is to build bigger telescopes to allow scientists to analyse the chemical composition of alien atmospheres, or to build the electromagnetic spacecraft. The sooner we explore other avenues of potential extraterrestrial hotspots such as UFOs or detecting alien planets, the better it will be for the rest of humanity. Otherwise, world governments and taxpayers in general will be questioning the value and sensibility of spending money on SETI using radio telescopes or even sending probes to neighbouring worlds in our solar system for evidence of alien bacteria given the unlikelihood of us finding ETs using this approach. Remember the possibility of contamination by Earthly bugs? Brookesmith 1984 The UFO Casebook, p.74. At any rate, if these aliens are typical of many other UFO cases (especially those involving small symmetrical metallic flying objects), it seems astonishing that not one ET is prepared to land on the front lawn of the White House in Washington, D.C., walk outside, knock on the door and say, "Hey guys, we are here!". Sounds more like the aliens have much better things to be doing than say "Hello!" to us. Or the aliens might be more concerned about our attitude to diversity and not showing enough love to all living things on our planet, including our own fellow human beings. So the better approach might be to keep away from us and let us work out our own problems. Maybe that is the greatest concern we have to deal with. For further details about this UFO case with the French lavender farmer, click here. This pen-like handheld device most probably works on the principle of emitting high frequency radiation to ionise the air molecules, or generate and emit ionised particles of a certain electrical charge. On contact with the non-electrically conducting clothes and skin of the human witness, the charged particles tend to stick to the surface. The result is the formation of a strong electric field inside the muscles near the surface of the skin where the electrically-charged particles and molecules used to send electrical impulses through the nerve cells are disrupted. The subsequent temporary paralysis only affects the surface muscles in the arms, legs and torso. The field created in the muscles do not penetrate deep enough to affect the heart and other vital organs. Until the electrostatic charge on the surface of the human witness is dissipated, the person can remain immobilised. 7 News/Yahoo! : "Time travel a possibility: Hawking". 3 May 2010. Available from https://au.news.yahoo.com/qld/a/7153027/time-travel-possible-hawking; Jha 2010, p.4. One counter argument against the idea that ETs don't want to talk to us is the claim that some humans may have already worked out the secret to UFO technology and fully understand the situation with ETs. To these people, rumours have it that some ETs may already be communicating with them. Of particular regard are those members of the USAF who are involved in supersecret studies of alleged crashed UFO(s) recovered from the late 1940s (classic example would have to be the shape-memory alloyed skin object recovered in New Mexico on 2-3 July 1947). Yet the question must be asked, why would ETs choose to talk to these people and not the rest of humanity? What exactly will ETs gain from selectively communicating with certain humans no matter how much knowledge the Earthly hosts may have gained from certain sources? If we could rely on some UFO reports, we can observe examples of objects trying to teach humans something about UFO technology, such as spiralling motions, S-shaped flight patterns, demonstrating the relationship between the frequency of the flashing glowing lights or regions on the UFOs to the speed, the willingness in some abduction cases to allow human abductees to look around the "craft" before leaving, and so on. This is not exactly indicative of ETs choosing to be selective in their communication to humans. Rather, they are willing to help a wider variety of people to see if people can learn from the observations, or at least tell others what they saw and allow our scientists to figure it out. If ETs have already spoken to elite USAF officials and scientists in secret military establishments such as Area 51, why stop there? ETs would have done the same for the rest of humanity. Either ETs will make the communication known to all of humanity, or ETs will continue to keep away and watch us from a distance, and perhaps teach us some things. It is highly unlikely ETs will choose to restrict their communications to just a few "chosen" humans while more and more people worldwide are coming to the realisation, based on sound scientific observations of the universe, that they should exist. Once the world is fully aware of the electromagnetic technology behind UFOs and aliens are not here to do anything other than to observe and learn, expect the communication to be more open and worldwide. Of course, there will be obvious superficial differences to be observed in the aliens emanating from different civilisations. This is to be expected. However, it should be noted that the common humanoid shape of the aliens as seen by virtually all human UFO witnesses will not be viewed as a coincidence or a rare event. Since the same laws of physics apply throughout the universe on all planets that support life, not only should we expect to observe humanoid aliens for creatures who have learned to survive on land and stand upright in the presence of the gravitational field of their own planets while pushing themselves to find the best way to survive and escape the native predators, but it should tell us that we are also dealing with highly intelligent species capable of manipulating the environment and creating a sophisticated technology. As such, we should always treat such creatures with respect and love as if they are our universal family members, just as we should do for our own fellow human beings. There should be absolutely no discrimination whatsoever in how we treat all intelligent humanoid creatures in the universe. Hough & Randles 1991, p.62.